JAKE is an objects-first tool, built using the object-oriented Java language. One of the advantages of using robots is that there’s a clear model for inheritance. In the current build, the JAKE architecture has a number of classes. The World owns several WorldObjects. There are different kinds of world object: Walls, Beepers and Movers. Walls are solid structures that block off paths in the World. Beepers are just that – little devices that “beep” so that they can be detected by the robots. For now, Movers are the most interesting class. Just like there are different kinds of WorldObject – one of which is the Mover – there are different kinds of Mover. All Movers can, well, move. Different kinds of Movers behave in different ways, but all have a move() method. The first type of Mover to be created was the Robot. 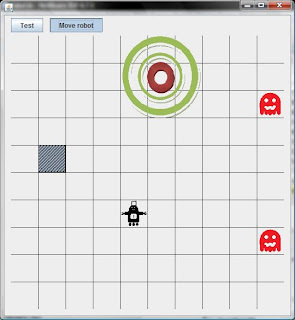 The Robot class represents a basic robot that can move forwards, turn, and do some other (similarly exciting) things. Jake – our main character – is one of these Robots. 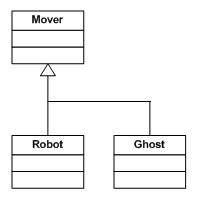 To demonstrate the different kinds of Mover, the JAKE library now includes Ghosts. Remember PacMan? PacMan’s ghosts have found their way into Jake’s world, and they’re scaring him! 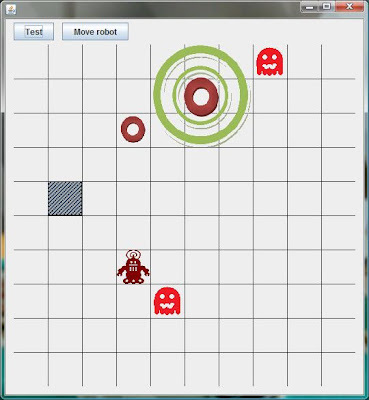 Robots respond to instructions from the programmer, but Ghosts don’t. Instead, they wander around the world randomly. Ghosts run on a timer and keep going until the program ends. They won’t pass through a wall or off the edge of the screen, and they turn themselves around every once in a while. Unlike normal Robots, Ghosts can’t be passed through – like Walls. Ghosts don’t really do any useful tasks, but they illustrate how the Mover class can be extended to do different things, and to look different.